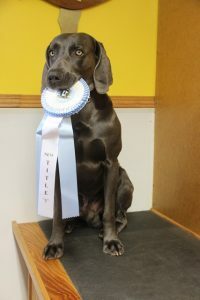 Home→Blue Weim Brags→Bo Earns RAE Title! Bo (Helfinstine’s Alabama Bleu Bojanges) earned his AKC Rally Advanced Excellent (RAE) title. Rally is an obedience team sport where the handler and their dog complete a course of 10-20 signs. The dog performs off-leash and should remain in heel position. Hand and verbal signals are allowed and may be repeated. Each sign depicts the skill the dog must perform. The team must earn qualifying scores in both Advanced B and Excellent B at ten separate licensed trials to earn the RAE title.